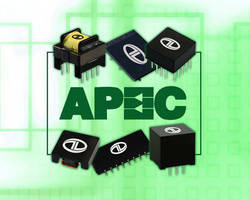 ROMOLAND, CA--See the latest in advanced magnetic technology, inductors and transformers from Datatronic at APEC 2012, Booth 816, February 5-9, in Orlando, Florida. To attend APEC. At APEC, Datatronic Distribution, Inc. (DDI), and Datatronics Romoland, Inc. (DRI), will showcase their latest magnetic components for commercial, industrial and military hi-reliability applications. DDI and DRI are widely recognized for its expertise in magnetics design, manufacturing technology, quality assurance,customer service and value. The company's business units are qualified to some of the industry's most demanding performance, quality and environmental standards, such as ISO, UL, BABT, VDE, MIL-PRF-27, MIL-PRF-21038, MIL-STD-981 and NASA Space Station Approved. Datatronic's new Selection Guide & Short Form Catalog will be available at APEC. It provides specification information on dozens of transformers and inductors. For the designers of commercial, industrial and mission-critical electronics, the new guide includes descriptions of standard magnetic components available off-the-shelf as well as information that will assist them in designing special or custom devices. Datatronic Distribution, Inc. (DDI) is a recognized leader in transformers and inductors for a wide range of commercial and industrial electronics, including power supplies, power filtering equipment, industrial controls, instrumentation, telecommunications and more. Magnetic components from Datatronic Distribution are commonly found in point-of-saleterminals, commercial lighting controls, automobile engine systems and solar power generating stations. Datatronics Romoland, Inc., (DRI) is a world leader in transformers and inductors for electronic equipment supporting a wide range of mission-critical applications in aerospace, avionics, military, medical and telecommunications. Magnetic components from Datatronics Romoland are found on many of today's most advanced military aircraft, satellites, missile systems, radio communications, night vision goggles, heart pacemakers and portable heart defibrillators. Established in 1971, Datatronic is a global leader in the development of innovative magnetics technologies and component products supported through world class manufacturing, total quality management, responsive service and superior value. The company consists of two separate businesses units: Datatronic Distribution, Inc., and Datatronics Romoland, Inc. Bottle Capping Headsets drop into rotary capping machines.